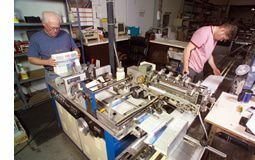 Mail Labeling / Mailing Labels | Mail-O-Matic Services Ltd.
Mail-O-Matic has several advanced processes in our production plant to quickly and accurately print direct addressed information on mailing labels and attach to documents, envelopes, and mail pieces. Accurate information on mailing labels that are securely fastened onto your mail piece is perhaps the most important step of the direct marketing process. Without it, your mail piece won’t reach its intended market. Trust Mail-O-Matic to print and secure your mailing labels professionally the first time, all the time.